If you drive frequently, then this has probably happened to you – you’re going for an important meeting, a date or even a job interview and your car won’t start. This could be resulted from leaving the lights on, having an old battery or leaving the keys in the ignition. While you might have been lucky not to experience this, you are very likely to fall victim to this at some point. So what do you do when this happens? How do you start car with dead battery? Read on to find out. You would normally need a jumper cable to start the car. Below we explore your options. Get a functioning car and park next to yours so that the vehicles face each other. If you have a manual transmission car, set it to neutral. If it’s automatic, put the vehicle in park. Make sure to set the parking brakes on both vehicles to prevent them from moving unexpectedly. Turn off both cars and remove the keys from the ignition. Take the jumper cables and set them down ensuring the clamps aren’t touching each other. Pop the hoods of both cars open and locate their battery terminals. Identify the positive and negative terminals. They’re usually marked with a “+” or “-“ on top. Wipe off any dirt on the battery terminals with a wire brush or rag. Attach the red cable clamp to the positive (+) battery terminal of the dead battery. Make sure the connection to the battery terminal is solid. Attach the other end of the red cable clamp to the positive (+) battery terminal of the functioning battery. Connect the negative cable clamp to the negative (-) terminal of the working battery. Don’t connect the negative cable clamp to the dead battery; instead, attach that clamp to an unpainted metal part of the vehicle. You can use a shiny, clean cut bolt on the car’s engine lock to guarantee a safe jump. You're now ready to start car with dead battery. Start the functioning vehicle, wait and let the car run for some time, at least one minute. The time length depends on how old the battery is and how often it is used. Start the dead car. If it doesn’t start, give the working vehicle a few more minutes to charge the dead battery and then try again. Sometimes, revving the working car’s engine while charging the battery can help. 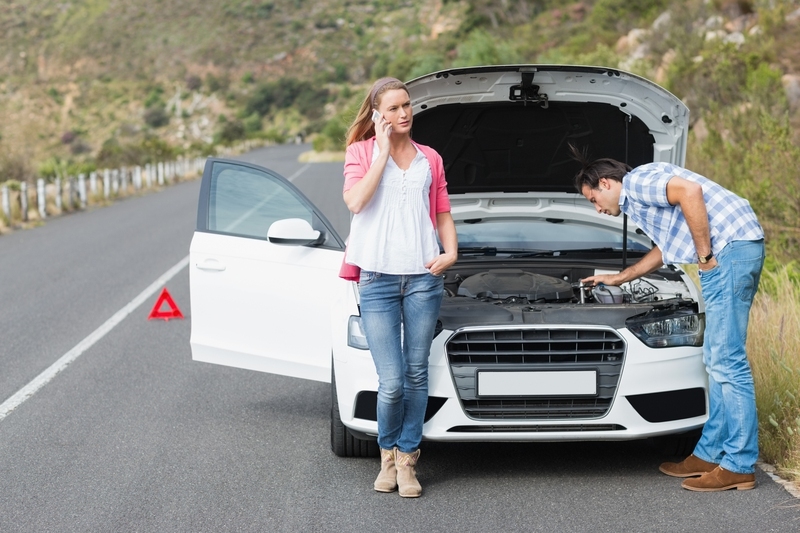 Disconnect the jumper cables, once the dead car starts running. Start with the black, negative clamps. Make sure the clamps do not touch each other while one or more parts of the cable are still attached to the car. Get into your car and take a short drive. Driving enables the alternator to charge the battery to ensure that it doesn’t die again after you’ve turned off the car. This method only works for manual transmission cars. Position your car at the top of a hill or have friends push the car. Step on the clutch making sure to depress it completely. Turn on the car’s ignition but do not start the engine. This is also referred to as key position 2 where you insert the key and turn it one step to the right. While keeping the clutch depressed, release the break. You will start coasting downhill or moving as a result of people pushing. Release the clutch immediately if the speed gets to 5mph/8km/h. This should jerk the engine into life. If it doesn’t start, depress and release the clutch again. This stands for friends and family. If you don’t have jumper cables, you probably have at least one friend or family member who owns one. They could also give you a ride if all else fails. To start a car with dead battery, you will need a helping hand as you cannot do it on your own. To start car with dead battery, you also have the option of using a towing service. Do use a reliable service provider to prevent damage to your car. Make sure to write down the number of a towing company and store it in your glove box. The number can be used by whoever is driving your car in case of an emergency. Your car can be taken to a location where the battery can be replaced or recharged. You will be charged $50 or more depending on the location, the service you choose, etc. It is also important to let the towing company know the type of your vehicle. You shouldn’t let them tow an all-wheel drive vehicle with the rear wheels dragging. Instead, ask for a flatbed tow truck. Whether you think you are a good driver or not, you should sign up for the AAA (the American Automobile Association) membership or any other motor club. Such clubs can come in handy when you want to start car with dead battery. The clubs offer a host of services including towing or jump starting your car on location. Charges vary from one club to the other. AAA membership usually starts from $52 per year depending on the level of membership you opt for. If you own a new vehicle that’s still under warranty, you could qualify for roadside assistance provided by the car’s manufacturer. Check the owner’s manual of your vehicle or get in touch with your dealer. You can usually find the user’s manual in the glove compartment.